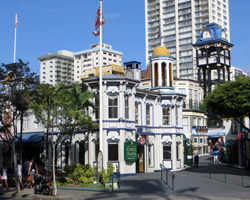 Kings Guard Museum: Discover a Piece of Hawaii History for Free in Waikiki. King's Guard Museum Spotlights Drill Team History! 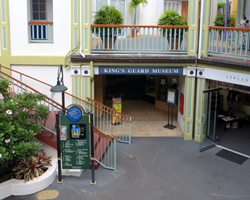 The King’s Guard Museum isn’t a major Hawaii attraction by any stretch of the imagination. Nevertheless, it’s a neat enough place to pop in for a few minutes if you’re already out shopping or dining in the area. Ideally, you’ll get to sneak a peek right after watching the King’s Guard changing ceremony. But it’s also a good rainy day diversion if the weather is keeping you from the beach. So what is the King’s Guard Museum? If my memory serves me correctly, it used to be the location of the old Rose and Crown Pub (which would be the only logical reason why the Rose and Crown sign is presently displayed there). 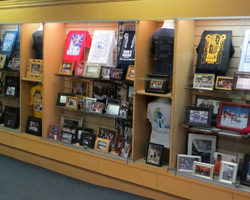 Otherwise, it’s basically a single, decent-sized room fronting the courtyard of the King’s Village Shopping Center, where it has been set aside to house and publicly display memorabilia related to the King’s Guard Drill Team. Having evolved from the tradition of Hawaii Reserve Officers’ Training Corps (ROTC) exhibition drills that were popular in the 1920’s and 30’s, the King’s Guard is an award-winning exhibition drill team that was inaugurated in 1972. Guards wear authentic nineteenth century Kingdom of Hawaii uniforms and impress spectators with their uniquely Hawaiian style of rapid rifle spinning routines. Their changing of the guard ceremony is billed to be the longest-running daily event in Waikiki! And the King’s Guard also frequently represents Hawaii at events such as the U.S. presidential inauguration and honor guard details in other countries! If you’re really into history, the King’s Guard Museum is about one block in each direction from the Lucoral Museum and the Moana Surf Rider Hotel. You could do all three attractions in about an hour or two. 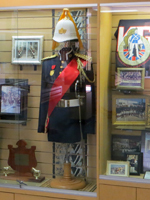 The King’s Guard Museum houses a collection of awards and honors that have been presented to the drill team plus several pictures and artifacts that have been donated by members of the King’s Guard. Most of the T-shirts and jackets look more like cool souvenirs than actual artifacts. But the uniforms and ceremonial gear is quite unique and interesting.